The FIFA World Cup provided a lot of food for thought in both athletic and socio-economic terms. RBTH looks at what Russian football publications had to say about the reasons behind Germany’s win and what key trends they identified in this edition of the tournament. The end of a World Cup tournament has always proved a good point for taking stock of the quality of soccer on show at the event; the heroes and villains; the new stars and the fading powers, as well as the current standing of the sport as a whole. Now that the curtain has fallen on the Brazilian showpiece, Russian journalists are evaluating the merits of the competition. With the bones of the Russian team’s disastrous group-stage exit already well and truly picked over, the country’s media have moved on to other topics, and attention naturally focused on the new world champion, Germany. 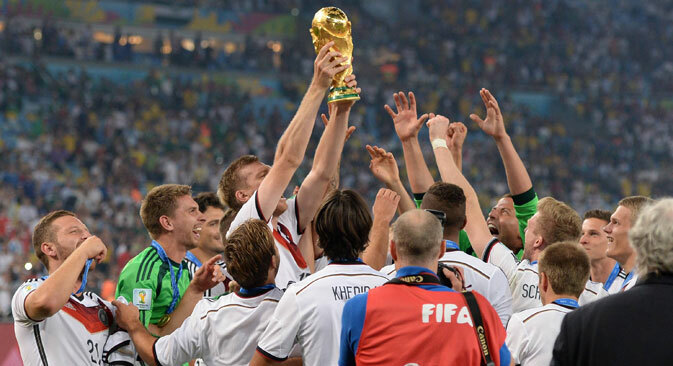 The German national team was ranked among the favorites to win even before the World Cup began, and indeed, Joachim Loew’s team managed to withstand the pressure and bring home the gold. Prominent journalist Igor Rabiner thinks the success of DieNationalmannschaft lies in its balanced composition. “The 2014 German national team is not the best team in the history of the game. It had some serious problems: Reus was injured, Schweinsteiger, and Khedira were not in their best conditions; the team wasn’t 100 percent ready; the central defenders were in extreme positions. But it was the only team at the World Cup to meet global quality standards. It is telling that four German footballers were nominated for best player, and they all represent different positions,” Rabiner wrote. Anton Mikhashenok, a columnist for Russian sports website championat.com, noted that the German team managed to avoid the player shortage that plagued other teams. “This was a World Cup that depended on Pirlo, Neymar, Messi, and Hazard. That’s why Germany won; it had an entire team of reserve players, ready to become key at any moment. Germany depended neither on Mueller (who missed his free-kick against Algeria) nor on Klose (who started the World Cup on the bench), nor did it depend on Kroos (who didn’t play at his best in the finals), or Lahm, or Neuer. The face of the German team was not Mario Goetze, who scored the golden goal, but Bastian Schweinsteiger, who was manhandled in the final match but still ran 15 kilometers and played the best match of his life,” Mikhashenok wrote. Sports blogger Denis Romantsov made note of Loew’s tactical maneuvers, which helped the German team finally win a significant tournament after a series of successful but ultimately fruitless competitions. “Loew’s players have matured, but Loew himself needed to mature and change. The program for developing young talent provided him with a wide selection; he simply had to use it cleverly and subtly. Intense pressure and active play resulted in 4:4 and 5:3 in matches with Sweden, but Germany bulldozed the rest of its rivals in the qualifying tournament. And judging by how Loew criticized his defenders even after their victory in a friendly match against France, it became clear that he had finally found a healthy balance between defense and attack but wanted to polish, rehearse, and memorize this team by heart, ideally in order to prevent another unexpected failure in the semi-finals of a serious tournament. There was no failure in the semi-finals; Germany gave its most jaw-dropping performance of the 21st century,” Romantsov wrote. FIFA’s decision to award Lionel Messi with the Golden Ball provoked stormy discussions in the Russian media, as he was perceived not to have played particularly well in the knock-out stages. In an article titled “Did Messi deserve the Golden Ball?,” Yury Ivanov, an expert for the Sportbox.ru website, analyzed the Argentine forward’s performance and arrived at the following conclusion: Messi had a few moments that were enough to cause trouble for his rivals, including Loew’s charges, but he showed little beyond his usual game. “There were many masters at the World Cup, who literally dragged their teams on mighty shoulders by performing crazy volumes of both creative and rough work – Arjen Robben, Mueller,” said Ivanov. Boris Levin, columnist for the newspaper Sport-Express, disagreed with Ivanov’s assessment. According to Levin, there were no decent candidates for the Golden Ball. “Who deserved the Golden Ball? Really, without exaggeration, on a par with Maradona in 1986, or Paolo Rossi in 1982, or Johan Cruyff in 1974? At its key stages, the World Cup turned weak, predictable, and essentially undramatic. It didn’t produce any real heroes. As usual, it just gave us Messi,” he wrote. Dmitry Girin, another writer for Sport-Express, noted that the most substantial tournaments have taken place in countries with strong football traditions.